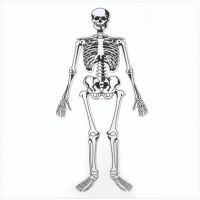 The Skeleton Floor Puzzle is a fun activity for children whether it is being used for educational purposes or pure spooky fun. Standing over 3 feet tall when completed, and with glow-in-the-dark pieces, this bony friend is sure to capture the kid’s attention. Ages 3+.